I should have hung a "Gone Fishing" sign on the little blog but for some reason couldn't bring myself to do it. My thinking was that any day the burnt out feeling that had come over me in late December would wash away and I'd be able to pick right up where I left off. Well, I was partially right. I was just wrong about how long it would take until I started feeling better. They might not run around with misspelled racist signs and openly carry weapons but make no mistake about it, Canada's tories are exactly the same as the crazed teaparty types down south. They have the same agenda and the same beliefs and are only interested in democracy so far as it suits them. 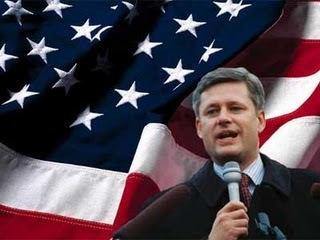 The fact that PM Harper could call this election "unnecessary" says all you need to know about him and his party. The only other kinds of officials who deem elections unnecessary are generally working for autocratic regimes... and that's exactly how the Canadian conservatives have governed these past five long years. I will do my level best on this blog and on my radio show to cover the upcoming election while keeping the focus on issues the Canadian MSM ignores. I will also post up podcasts of the best of my radio show at least once or twice a week.